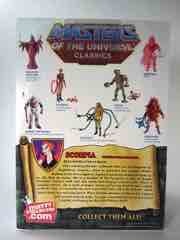 You generally can't go wrong with the Horde when it comes to Masters of the Universe Classics. 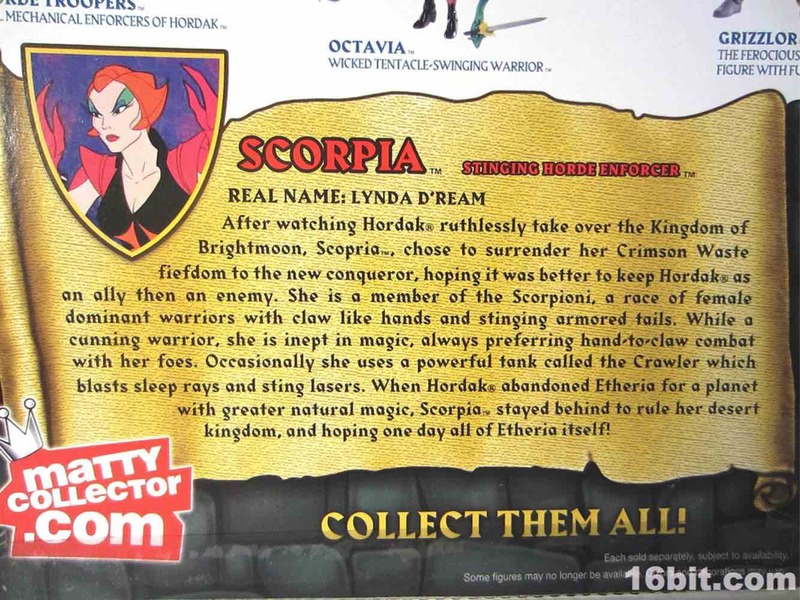 Between the original toys, the original concepts, and unmade cartoon characters there's too many good ideas. 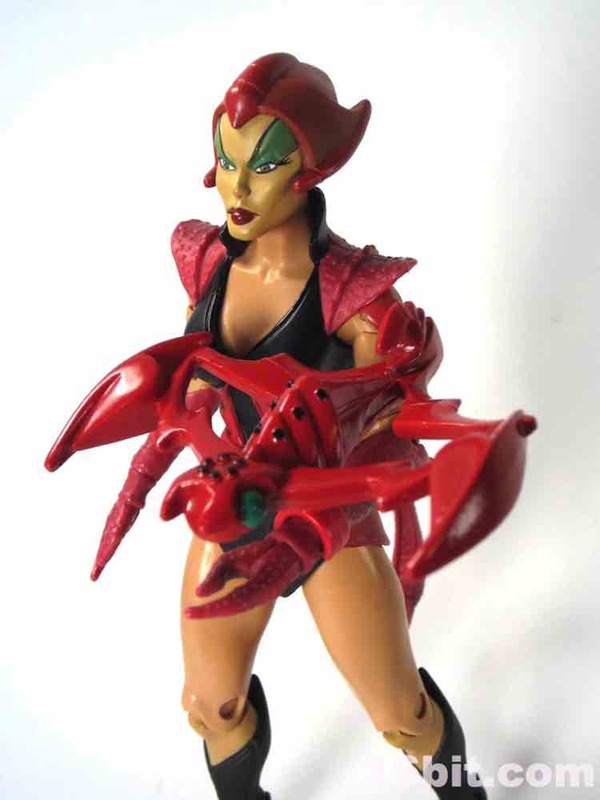 Scorpia comes from the Filmation Princess of Power sector and I don't really remember much of anything about her, not having seen many episodes recently outside what I saw on Qubo late at night. 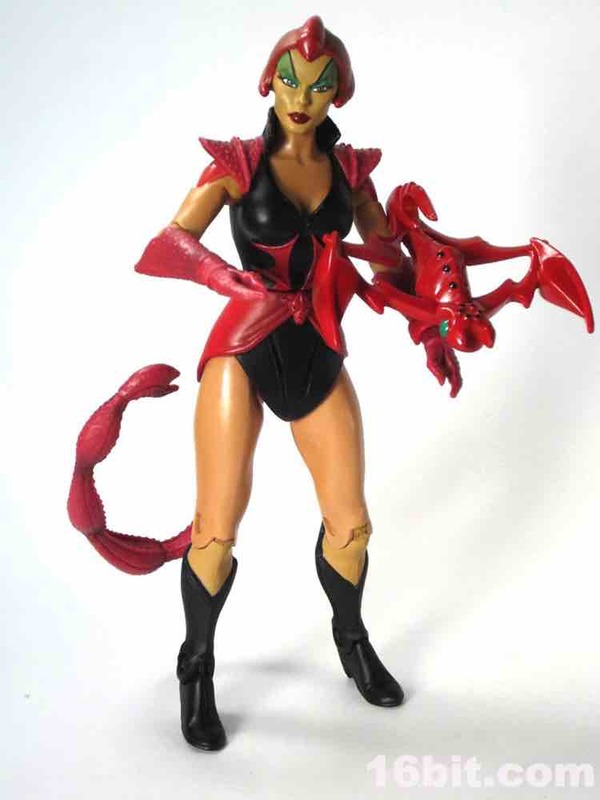 Of course, a truly neat action figure doesn't need a cartoon to be awesome - Scorpia stands on her own merits, and on her own two feet. 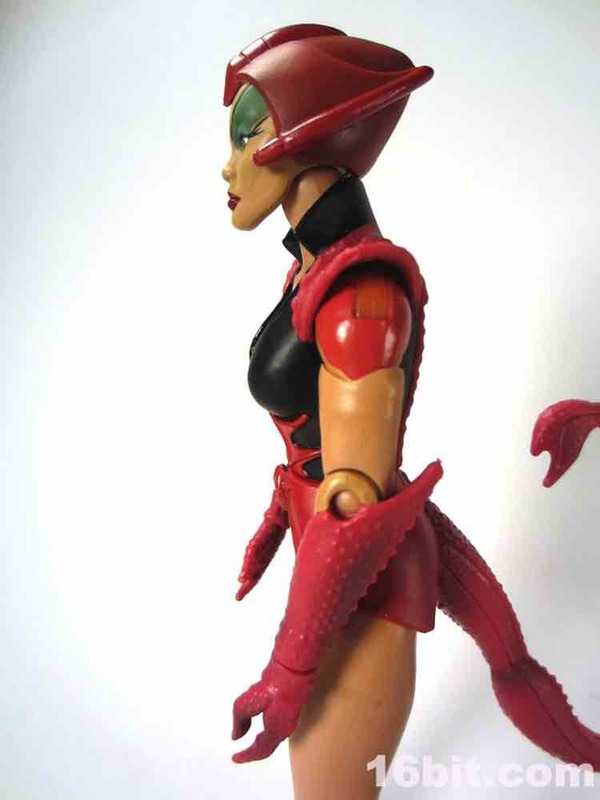 While the buck retains some old bits and pieces, there are tons of new parts here - her costume, forearms, hands, tail, weapon, and (correct me if I'm wrong) boots are all pretty new here. 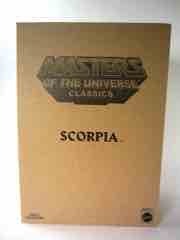 This is the first-ever Scorpia action figure and as such, she sold out rather quickly on Matty Collector. Rightly so, as the deco, texture, and overall execution here was spot-on. Garish makeup, scaly limbs, and a big ol' rubbery tail make this one of Matty's recent winners. And there have been many recent winners. Articulation is on par with most figures, minus a little bit. 18 joints make this a good, but not exceptional, figure in terms of movement. 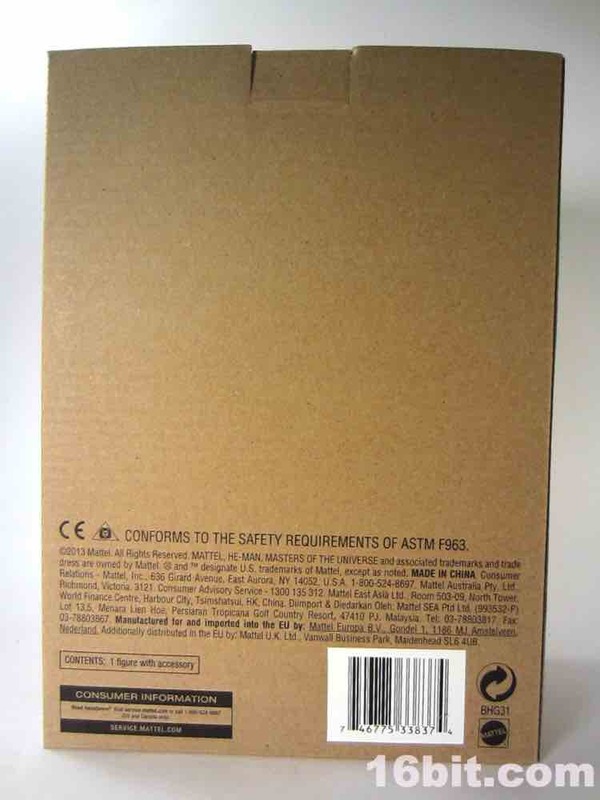 Some spikes on the back of her boots keep her from being able to bend her knees at a 90-degree angle, but the ultimate destination of this figure is going to be on a shelf, or on the card. Sitting on a chair is not in her future, so I guess I can easily let this one go. The bug parts have a wonderful texture, while the cloth bits are nicely painted. The glossy black trim on her dress looks superb, and the Horde motif on the front looks great. 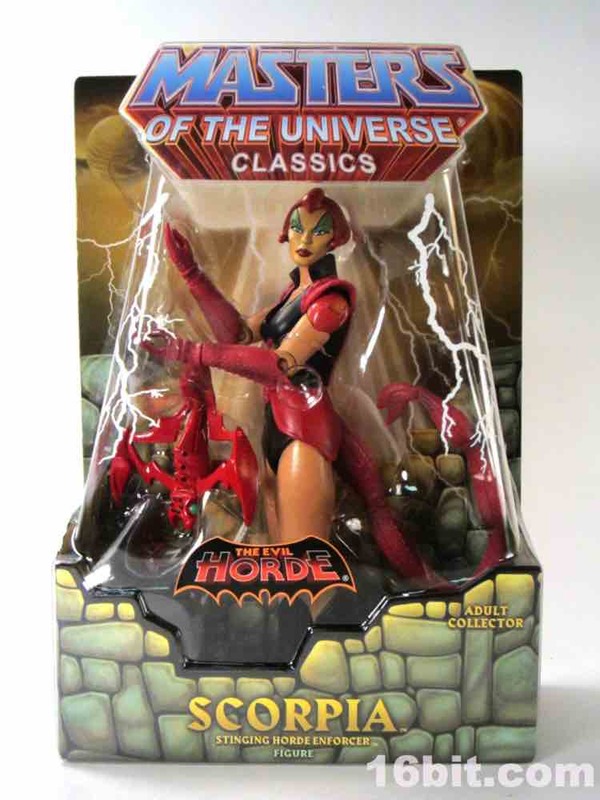 Her metallic red helmet sports two shades of red, while her make-up may be more ornate than any entire figure from the vintage line. 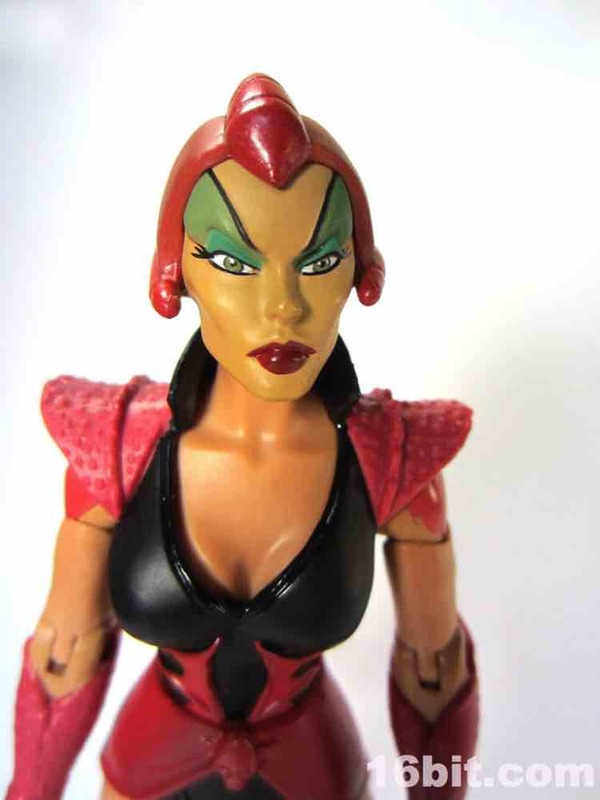 Deep red lipstick, two flavors of green over her eyes, sharp cheekbones, and steely eyes make her head one of the best in Mattel's entire product catalog. Seriously, I've seen a lot of dolls and action figures and this is easily one of the best I've ever seen from them. 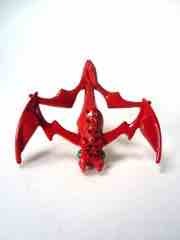 Her backside has a red tail hanging off of it with subtle paint shading bringing it to life, and it's a little rubbery. Right now it stands tall and proud, but I don't know how gravity will treat it over the coming years. Propping her up with the tail in a position where it won't get smooshed may be wise, or perhaps posing her on the side - as seen in the packaged shots below - could be a good idea. 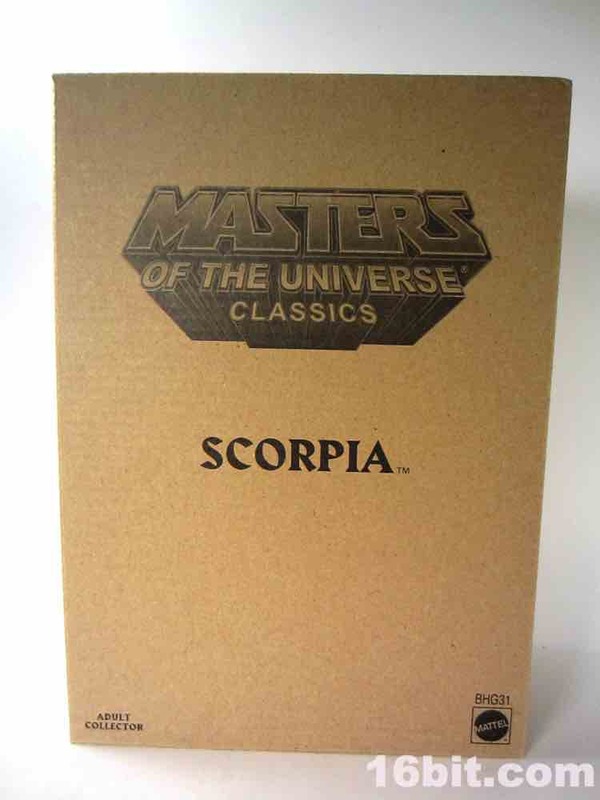 I rarely comment on the packaging here, but it really does do wonders in showing off the figure's considerable assets in sculpting and deco - plus without the tail, she loses a little bit of her personality. 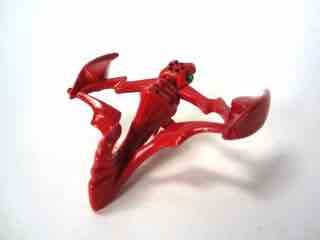 The only place this figure genuinely comes up short is in accessories, as she has but one Horde Crossbow. It's a new tool, but it's a good one - a glossy red scorpion-themed weapon has a sharp tail, black dots, green eyes, and generally looks adorable. I'm not sure if that was the intent, but it's a cute accessory and helps soften the utterly severe look on her face. 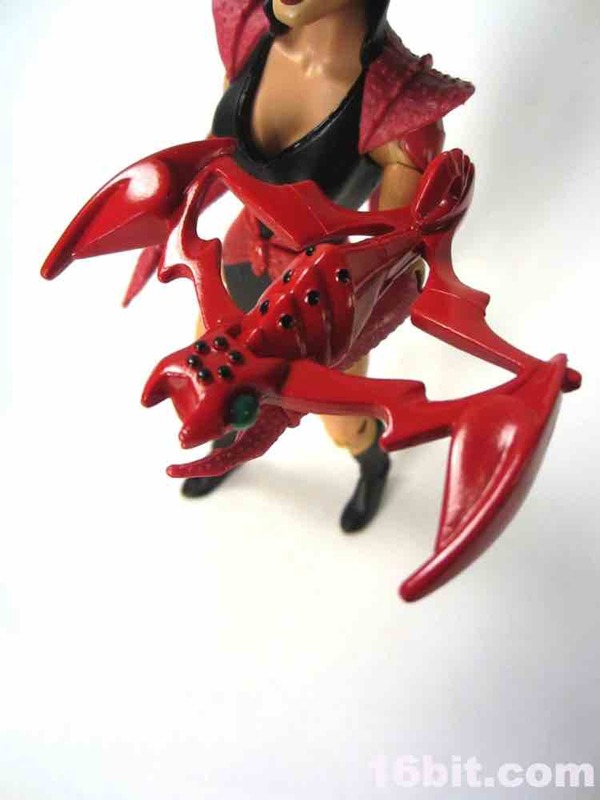 Due to her small pincer hands, the weapon clamps on to her wrist - it's a tight fit, though, so you may not want to leave it there permanently. 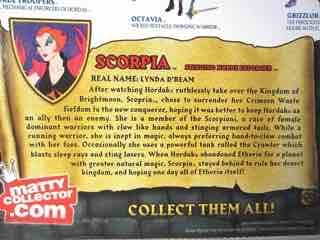 I'm more excited about the Horde villains than I should be as Filmation goes. Those animators really came up with a killer suite of characters for the She-Ra cartoon like Octavia and Shadow Weaver, and I'm delighted to have them sitting here with me so that i see them every time I leave my office to go to the bathroom. (They're on the way, not in the bathroom.) When people look back at this line in the future, I'm sure the Horde will get high marks across the board so it stands to reason that these may be a tad bit more expensive if you wait too long. 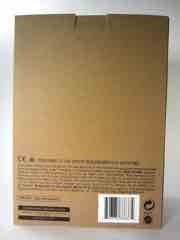 Hopefully Mattel held back a few so you can get her cheap. A lot of Mattel's figures turned out well, but this one turned out really well. 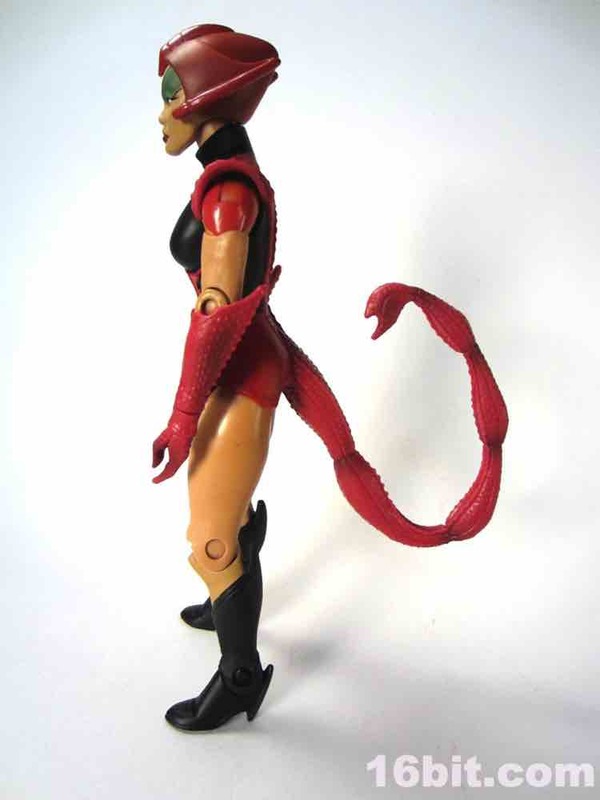 In terms of sculpt and deco, Scorpia gives other similarly sized action figure lines a run for their money - she won't be able to sit in any vehicles, but that's OK. You'd want to see her tail, anyway.